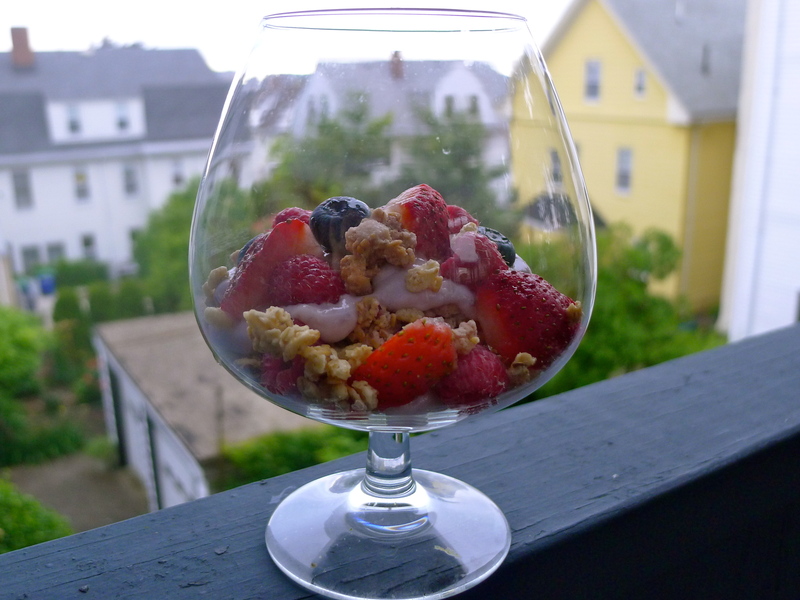 Parfait for me: Blueberry yogurt, granola and fresh berries. 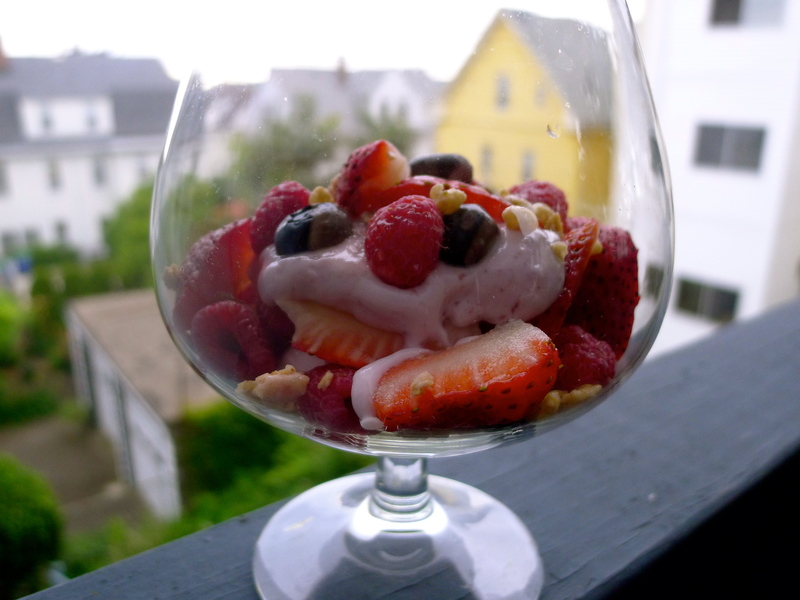 Parfait is French for ‘perfect’, and my taste buds have taken a fancy to yogurt parfaits lately. While the word ‘breakfast’ sounds very comforting, I must admit that the thought of toiling over pots and pans, early in the morning, to dish out one is rather discomforting. 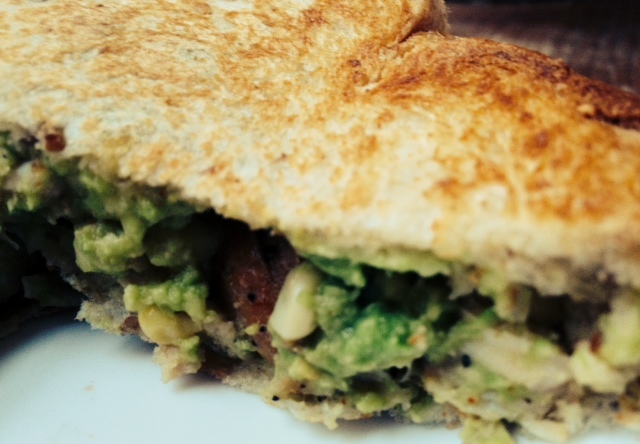 When it comes to breakfast, I prefer something that doesn’t involve the use of the stovetop, microwave or oven. And yogurt parfaits adhere to my preference. 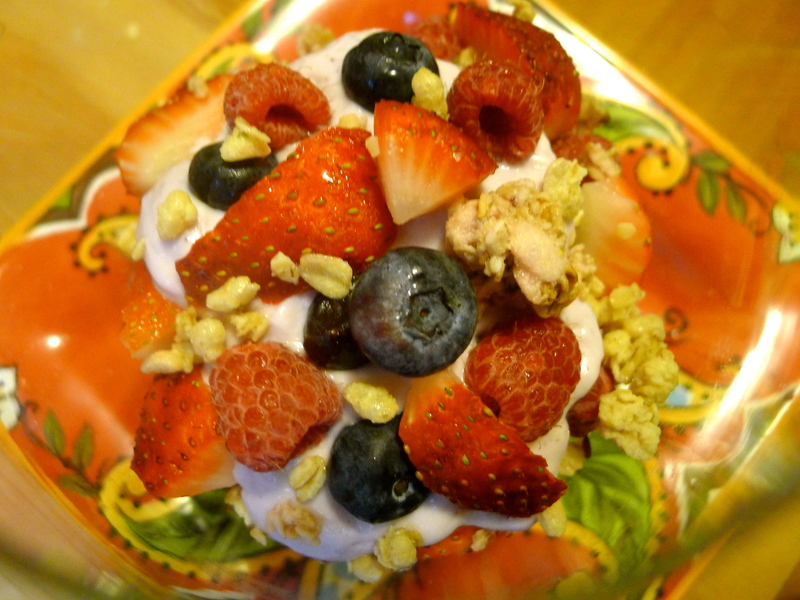 Under 300 calories: Blueberry yogurt – 140 calories; half-cup fresh berries – about 40 calories; a generous sprinkling of granola – about 100 calories. A medley of fruits (go for seasonal [organic?] fruits); yogurt of your choice (plain or flavored) and a generous sprinkling of granola (I get mine from Whole Foods [really?] )has the potency to kick start your day in a healthy way. With homemade parfaits you have control over the calorie intake and also partake in the “know your food” part of the “Know your Farmer, Know your Food” campaign. Buy the ingredients from your local farmers’ market and you will get to “know your farmer” too. 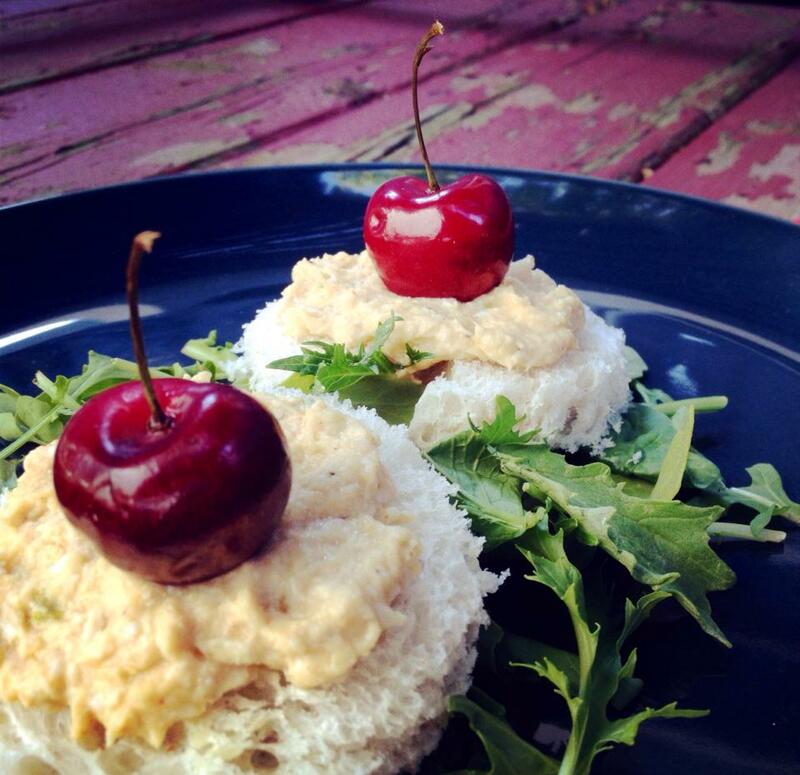 The parfaits act like analgesics in calming down cravings in-between-meals and also does a commendable job in pleasing your sweet tooth, in the guise of a dessert. The smooth and luscious yogurt combined with sweet berries, interlaced with bursts of tartness, and the crunchy granola won’t disappoint you! Categories: Breakfast, Something Sweet | Tags: berries, breakfast, dessert, fruits, granola, healthy food, parfait, snack, yogurt, yogurt parfait | Permalink. No matter how much I like frittatas, they seem to be a very pretentious dish to me; because of the fancy name tag. 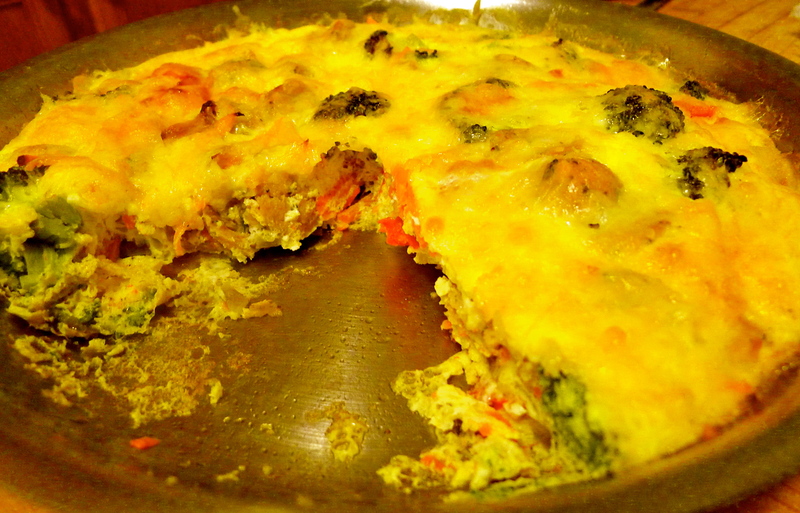 Frittata thou art nothing but a giant stuffed omelet to me! 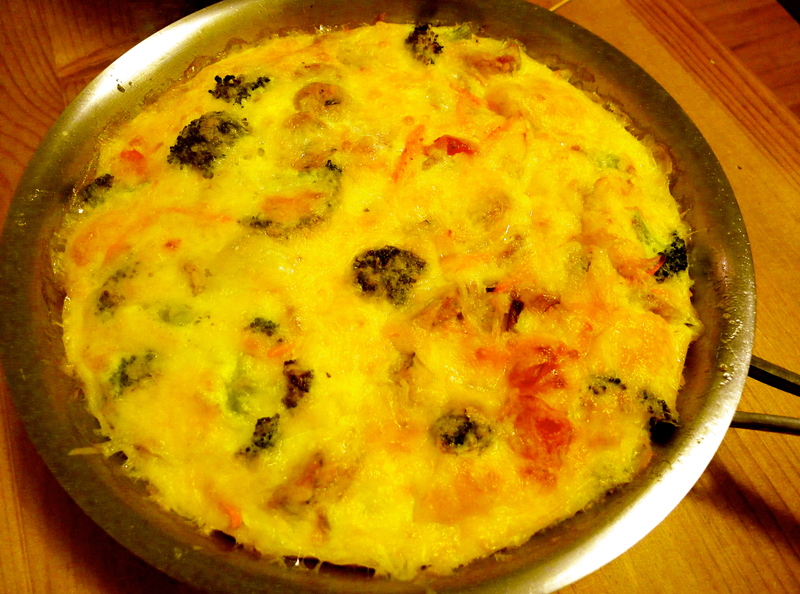 Categories: Breakfast, Eggs | Tags: egg, eggs.quick fix dinner, frittata, omelet, one pot meal, stuffed omelet | Permalink. Kerosene smell floats in the air as the stove is turned on. The wind keeps teasing the fire intermittently. A generous amount of dough is scooped out of the humongous ball of mother dough and rolled out into a perfectly round paratha; eggs are cracked and beat up in seconds. The paratha gets a quick sear on the crackling hot tava (pan) and is set aside to rest. The tava is then drizzled with a generous amount of oil, luring the eggs towards it. The scorching tava devours the bubbles at no time revealing a perfect omelette. The pre-heated paratha is placed over the omelette and pressed down with a spatula to marry them together. It is then flipped egg-side up, slided to the counter where its center is decked with julienned onions and cucumbers, a sprinkle of green chili pieces, and a drizzle of tomato and chili sauce. Finally it’s rolled up and wrapped in wax paper. That’s how egg rolls are served at roadside mobile food stalls in Kolkata. A quick bite leaves you mesmerized, so does the showmanship of the cook dishing out multiple rolls at a time. The cling-clang sound of his steel spatula working against the aluminium tava blackened with use, is music to the ears of a foodie. Every move makes your stomach growl with excitement and anticipation of savoring the finished product. But my love affair with egg rolls from roadside stalls had an abrupt ending. One night on my way back home I caught a dog sleeping soundly on the counter of one of the stalls I frequented, the same counter on which the parathas for the rollswill be rolled out the next day! Fast food chains like Shiraz and Rahamania came to my rescue. They might not have been a healthier alternative but at least I knew these stores had shutters! Here I found a new love in ‘double egg double chicken’ roll; chicken adding a touch of sophistication to the otherwise humble roll. Today I am miles away from home; but at times I experience sudden bursts of craving for them. To satiate my urge I heat up ready-made parathas bought from a local Indian grocer. 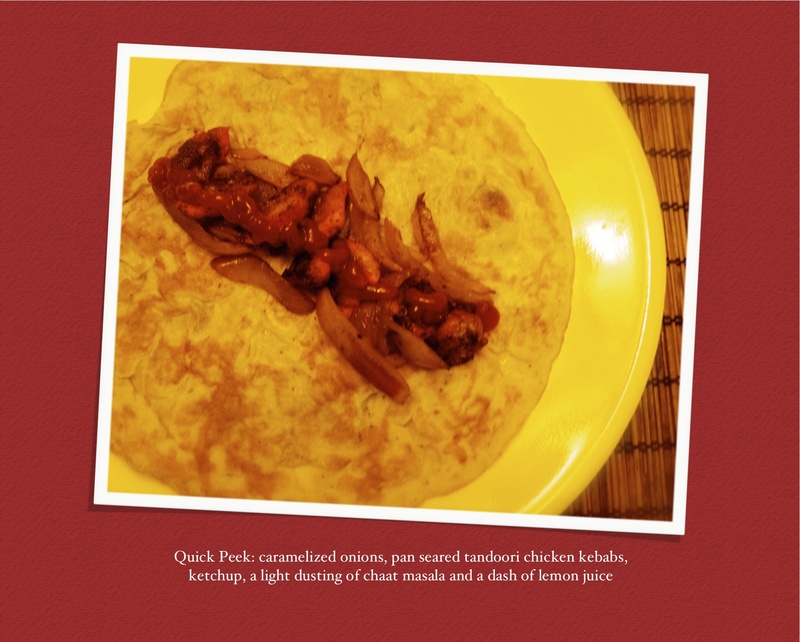 Caramelized onions and pan seared bite-sized chicken pieces marinated with tandoori masala serve as filling. All that’s left to prepare is the double egg omelette. 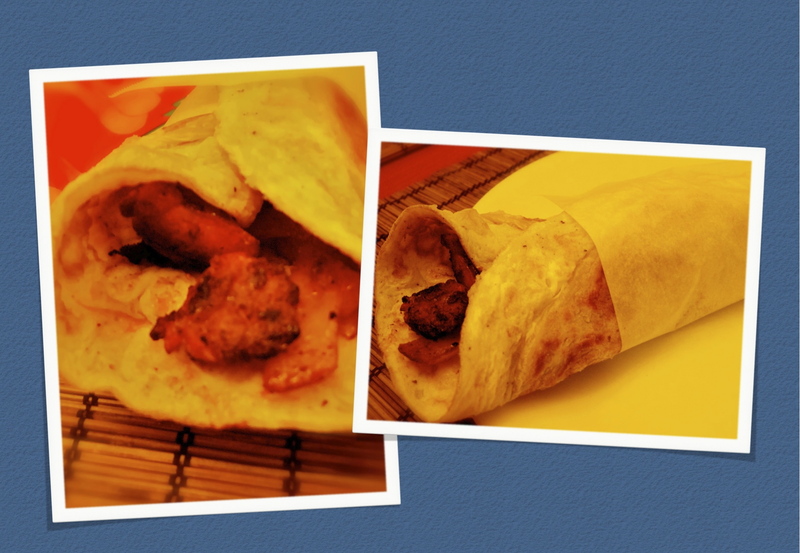 And I am just a wrap away from enjoying a guilt-free roll! Categories: Breakfast, Chicken, Eggs, Non-vegetarian | Tags: double egg double chicken roll, egg, egg chicken roll, egg roll, egg roll recipe, indian food, Kolkata, kolkata egg roll, kolkata street food, paratha, roll, street food, wrap | Permalink.